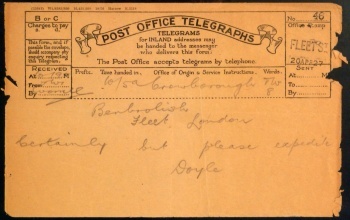 This 8-word telegram was written by Arthur Conan Doyle on 20 april 1927 at the Crowborough Post Office (Sussex), sent to publisher Benn Brothers Ltd., Bouverie House, Fleet Street, E.C.4. (Telegram address : Benbrolish, Fleet, London). This page was last edited on 9 November 2018, at 15:59.